Sheryl Kirby is my hero | Mmm, Tasty! So a few weeks ago I was reading the forums on my favourite Ottawa foodie website, which I still visit on a regular basis so I know what new restaurants to try when ever I’m in town. Anyhow, on that day they were talking about where to get a decent Maritime donair in Ottawa. Someone had posted a link to a blog post containing the original King of Donairs recipe. When I clicked through, I immediately recognized the blog as that of Toronto local and former Maritimer Sheryl Kirby, also of TasteTO. And to my surprise, she had also posted a vegetarian version of the recipe! Now, let’s be honest here – I hadn’t eaten many donairs before I became a vegetarian at the age of 13, so I never really had a chance to miss them. And while I did go back to eating chicken and fish for a few years in my mid/late twenties, donairs still wouldn’t have been on my menu. But I do have fond memories of them from my childhood in Nova Scotia – friends and family would order them and I’d order some garlic fingers or a vegetarian sub. The smell of the donairs was just awesome and I sometimes wished there was a vegetarian version for me to try. So tonight I made Sheryl’s vegatarian version, and I have to say it was quite awesome. The sauce recipe was better than the one that I’ve used before as garlic finger dipping sauce, and the ‘meat’ was super flavourful. 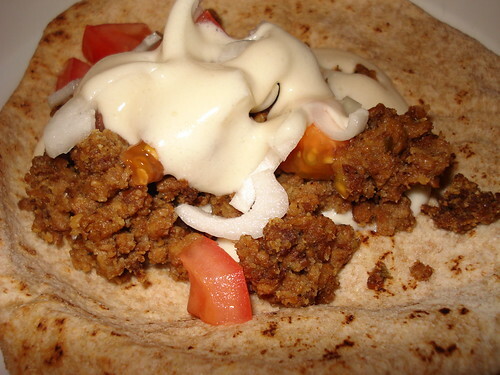 I did right by the donair by using plain old tomato and yellow onion, but admittedly I did use whole wheat pita. A correct version would have used plain white pita, preferably the more ‘Greek’ style (slightly thicker and often made without a pocket). How did it all taste? It was awesome. I’d make it again in a heartbeat. If you’d like to make it too, go check out the recipe over here.